That’s the question on the top of Sangram Vajre‘s mind. And it should be. Sangram is the CMO of Terminus, a software company in business to help marketers use ABM to grow revenue. And it should be at the top of your mind too. ABM is the hot topic among B2B marketers right now. The topic is taking over events, webinars, blogs, social media. Everyone is talking about it and Google Trends shows a sharp incline. I had the pleasure of meeting and seeing Sangram speak about account-based marketing at Vidyard’s Space Camp last week. 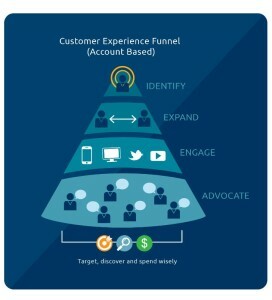 As B2B marketers, we are all very familiar with the traditional funnel. Target broad audiences and work to increase awareness and demand amongst that large pool of contacts. funnel. Here’s how: Instead start by identifying the best-fit, right set of companies to market to. From there, marketers should focus onexpanding to the right people in similar roles within that target account list. Marketers can then focus on engaging those contacts with the right content about the right topics on the right channel. Once that is all in place, marketers can then focus on building advocates within their active customer bases. Sangram offered five ideas to get started with ABM. Remember, these will only work if sales and marketing are in lock-step with one another! Boost awareness among named accounts: First, identify a list of target accounts with your sales team and get your message in front of them in every way possible. Think air cover campaigns on social and search and direct mail campaigns to stand out from the crowd.Think nurturing on steroids: Imaging turning email campaigns into account-based campaigns on the fly. What will you do with your pipeline numbers?Wake the account and not just a lead: Marketers spend so much time and money on getting leads but only a few convert into opportunities. What if you can find a new champion in your target company? Remember, companies close accounts, not leads.Go big on events: Scan badges at an event? Instead of just emailing the names you collected, follow up on the entire account for the next 90 days.Always on air cover campaigns: When a prospect converts into a lead, think about putting your message in from of the entire account and continue to stay top of mind. How has your experience with account-based marketing been?